More than 200 Iraqi civilians have lost a High Court bid for a public inquiry into claims they were mistreated by British forces in Iraq. Two judges upheld Defence Secretary Liam Fox's refusal to order a wide-ranging investigation, but said one could be "required in due course". Mr Fox argued one was unnecessary as any abuse had been carried out by "a few bad apples" and was not systemic. 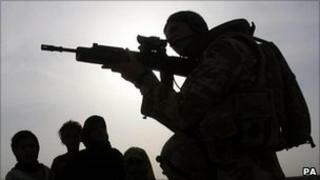 Lawyers for the Iraqis said they would appeal against the decision. The lead claimant, Ali Zaki Mousa, alleges he endured months of beatings and other abuse in the custody of British soldiers in 2006-07. In an interview in 2006, he told the BBC World Service he had been blindfolded and beaten by UK troops after being arrested in the southern Iraqi city of Basra on suspicion of being affiliated with militias. The Ministry of Defence has set up a dedicated Iraq historic allegations team to look into claims of abuse by British soldiers. Two other investigations are also under way into specific allegations of ill-treatment. One concerns Baha Mousa, an Iraqi man who died in British custody in 2003, and the other centres on claims that 20 Iraqis were killed and nine others mistreated at UK bases in 2004. Public Interest Lawyers (PIL), which represented the Iraqis, had argued that those investigations were insufficient to meet the UK's obligations under Article 3 of the European Convention on Human Rights, which prohibits inhuman and degrading treatment. But Lord Justice Richards and Mr Justice Silber ruled on Tuesday that another inquiry was not necessary at this stage. "It is possible that a public inquiry will be required in due course, but the need for an inquiry and precise scope of the issues that any such inquiry should cover can lawfully be left for decision at a future date," they said. The judges said the defence secretary had "made clear that he is very concerned about the allegations and extremely anxious to establish whether they are well founded and, if they are, to ensure that lessons are learned for the future. "He does not seek to defend Article 3 ill-treatment of detainees." The judges added that Mr Fox's "wait and see" approach was influenced in part by the "heavy resource implications" of establishing another inquiry now. Solicitor Phil Shiner, from PIL, said afterwards the Iraqi claimants were "bitterly disappointed". "Their accounts detail thousands of instances of sexual, physical and psychological abuse - abuse that clearly had systemic causes which cannot be investigated by an internal MoD investigation manned by the Royal Military Police," he said. "We will appeal this verdict, but it is important to note that the court has not said that a public inquiry is unnecessary." The defence secretary said he was pleased with the decision and would oppose any attempt to appeal. "This government does not accept that a public inquiry into these unproven allegations is the best course of action," he said. "A costly public inquiry would be unable to investigate individual criminal behaviour or impose punishments." Mr Fox said the historic allegations team would review all claims made against UK troops, and added: "We must remember that the overwhelming majority of our armed forces conducted themselves with decency and honour, but there may have been occasional lapses in a very violent conflict."